A focus on nameless people who are out of work, reveals that our voices are always at work, even when we are not. In some occupations, perhaps most, certain voices are particularly important. Diagnosing and directing are essential parts of being a paramedic. Detectives need to probe and critique. Salespeople need to use both inquiry and advocacy. But what about the out-of-work? 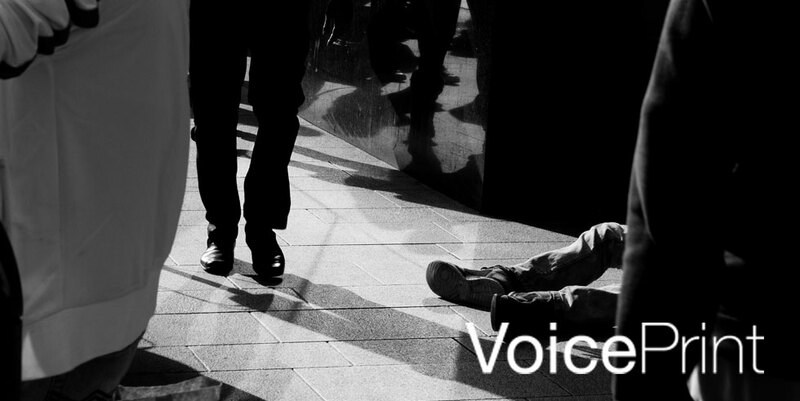 Are they voiceless as well as jobless? Many people beg for money on the streets of London. Four of them recently caught my ear. The two instrumentalists busking outside Farringdon Station were using the universal language of music to sell themselves. Whether or not their passing audience had a taste for the jaunty strains of mandolin and bouzouki, there was no question that it picked them out from the crowd. It might only be gaining them fleeting moments of attention, but it was turning heads towards them, and there at their feet was the hat, perhaps primed but already containing a few coins. It was clear what they were saying. But which voice is this in VoicePrint terms? It’s tempting to think of it as a form of question, a way of asking, ‘Will you give us some money for entertaining you?’ But that would be a very implicit sort of question, at odds with the nature of true Inquiry, which asks without preconception. So you might hear it as a form of Probe, an indirect way of gently exploring whether there is a basis for a transaction. But it seems to me that busking is a form of advocacy. There’s no real ambiguity to be explored. It’s a way of presenting yourself and your position. It’s a way of standing out and making your case for support. 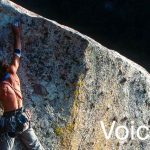 It’s also a reminder that there is an element of performance in the use of the Advocate voice, that entertaining others is one way of endeavouring to win them over. I was only a few yards further up the street when I heard the next. She was sitting on the pavement, bundled in a dull, shapeless coat, her shoulders wrapped in a blanket, her head swathed in a plain scarf. ‘Please.’ That was all she said. A small word in a small voice. It was as tentative as the way she held out her hand, listless, short of hope or expectation. ‘Please.’ It was so quiet, so powerless, I barely heard it. ‘Please’ here is not a question. It’s a signal, a weak, flickering sign that’s as far removed from a bold, flashing neon advertisement as you can get. But it is another form of advocacy. ’Please’ is the advocacy of the anonymous, the voice of poverty, the last uttering before the silence of complete helplessness. The barefooted man on the pavement in Piccadilly invoked that common humanity in a different way. He’d been sleeping rough in a stained sleeping bag and a sprawl of cardboard blankets, outside the well-heeled shops on the south side of the street. He was sitting as I approached and I saw him hold out his hand and say something to the man who happened to be passing at that moment. I couldn’t hear what was said, but the passer-by swerved abruptly away from the outstretched hand. Barefoot leapt up, wild-haired and wild-eyed, spit-firing a mouthful of abuse at swerving man, now hurrying-away head-down man, and at the uncharitable world in general. He swore until he and his anger had subsided back to the pavement. Advocating often comes loaded with emotion. From anger and distress to outrage and compassion, feeling can give advocacy an added weight and resonance – at least to the ears of some – that coolly-argued logic cannot provide. But emotion in a voice is like a fizzy mixer in a drink, it accelerates its impact, positive or negative. Emotion can twist a functional voice into its dysfunctional counterpart – it can turn advocacy into a harangue – or even into a different voice altogether. Unmanaged emotion often turns it into an over-blown controlling voice. It’s small wonder that begging in your bare feet leaves a thin skin between speaking up as a fellow human being and shouting out at being shunned, between Advocating and Challenging, the principal voices for expressing difference. Our voices are always at work, whether we are or not. Advocacy can be explicit and forceful or tacit and passive. It can be direct or indirect. It can be sustained and amplified by role, responsibility, status and expertise, or undermined and diminished by inexperience or lack of seniority as well as by joblessness, poverty, homelessness and discrimination. Some conditions assist it to be central to dialogue and discussion, others drive it to the edge, the periphery, the margin. But its function remains the same – to put your position to others. This is something that every individual needs to be able to do, in work or out. Subscribe to get our latest blogs straight to your inbox. We’re fascinated with people, with how they work, how they differ and how that influences the way they work together. We’re particularly interested in the way talk shapes how people think and interact, often without them realising it, sometimes with positive impact and sometimes with unintended and unproductive consequences. 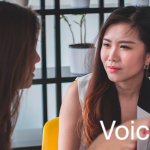 Our VoicePrint diagnostics shed light on these tendencies and their effects, while our VoicePrint developmental resources and interventions make people and organisations more effective in this essential inter-personal competence. How are we going to run this meeting? Matching words with intent, and why it really matters. VoicePrint. © Business Cognition Ltd 2019 All Rights Reserved. Each of us has a personal but largely unconscious profile of ‘voices’ which shapes the way we talk and the impact we make. We each favour some voices, and often over-rely on them, while neglecting others. The effect is not only to leave us less versatile than we could be and need to be, but also deaf and blind to our own inflexibilities and to the consequences of some of our actions. 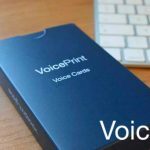 By bringing your personal pattern of voices, and its impact on others, into conscious awareness, VoicePrint makes your personal, inter-personal and organisational skill-set more complete, more agile and more effective.